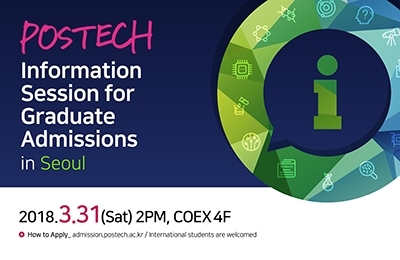 The Department of Industrial and Management Engineering at Pohang University of Science and Technology (POSTECH) invites applications for two full-time, tenure-track or tenured faculty positions.We are seeking candidates with a research focus in the two areas, (1) Human Factors Engineering (HCI/UX/Cognitive Engineering) and (2) Data Science (Data Mining/Applied Statistics /Information Systems/Big Data/AI), but outstanding applicants in the other areas of Industrial and Management Engineering will be also considered.The successful candidates are expected to establish a strong research program, ..
POSTECH has launched a new MOOC on Ferrous Technology. 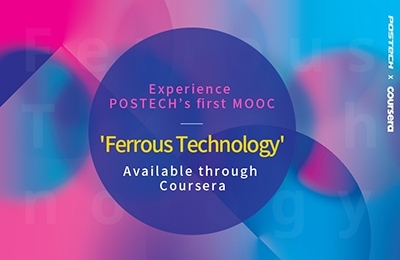 The two-part course will be available on Coursera from March 26 to July 21, 2018☞En..
Tenure-Track Faculty Positions in Condensed Matter Physics Experim.. 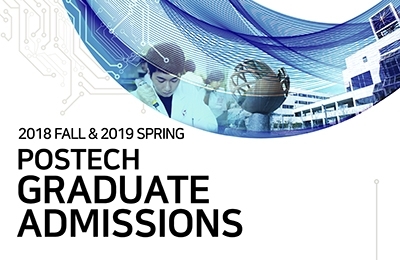 The Department of Physics (http://ph.postech.ac.kr) at Pohang University of Science and Technology (POSTECH http://www.postech.ac.kr/eng/) in Korea has openings of three tenure-track faculty positions in Condensed Matter Physics Experiment, Atomic Molecular and Optical Physics, Biological Physics, and Plasma Physics starting from the fall semester 2018 or spring semester 2019.We seek candidates with the potential to create internationally competitive research programs at POSTECH. Successful candidates are expected to have international recognition in their fields or a demonstrable potential fo.. 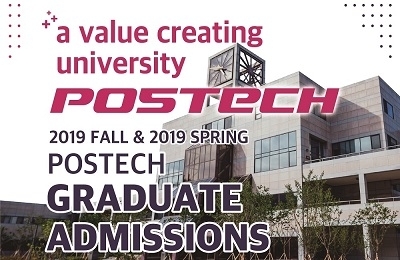 The Pohang University of Science and Technology (POSTECH) in South Korea is seeking outstanding applicants of all ranks to fill tenure-track faculty positions at the Department of Electrical Engineering. Applications are invited in all fields of Electrical Engineering with emphasis on the following fields:• Emerging electronic, photonic, spintronic, and quantum-computing devices (semiconductors, graphene, topological insulators, and organic materials)• Applied electromagnetic waves, including, but not limited to remote sensing applications and theory, radar, numerical computations, EMI/EMC..